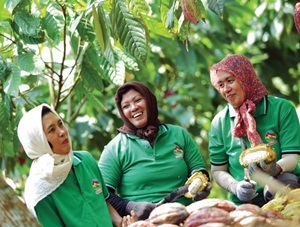 PT Perkebunan Nusantara XII - PTPN XII or PTPN 12 is a well-established plantation and agribusiness company in Indonesia, based in Surabaya East Java. PTPN 12 has 34 garden units in 80,000 hectares of plantation area throughout East Java province. PT Perkebunan Nusantara XII was established in 1996 as a merger results of 3 state plantation companies, namely ex PT Perkebunan XXIII (Persero), PT Perkebunan XXVI (Persero) and PT Perkebunan XXIX (Persero). PT Perkebunan Nusantara XII is a holding member of PT Perkebunan Nusantara III (Persero) or PTPN 3 Group, a leading state-owned agricultural holding company in Indonesia. As today, PTPN 3 Group holds 90% shares in PTPN 12 and other 10% remaining shares in PTPN 12 was owned by the Government of Indonesia. As of December 2017, PTPN 12 has 4 subsidiaries; PT Rolas Nusantara Mandiri, PT Rolas Nusantara Medika, PT Industri Gula Glenmore, and PT Rolas Nusantara Tambang. JobsCDC.com now available on android device. Download now on Google Play here. Please be aware of recruitment fraud. The entire stage of this selection process is free of charge. PT Perkebunan Nusantara XII - D3, S1 PWKT Staff PTPN Group April 2019 will never ask for fees or upfront payments for any purposes during the recruitment process such as transportation and accommodation.